I was on a roll today with interesting combinations – some on purpose and some not! I couldn’t decide what I wanted for breakfast, so I mixed a few things together: Greek yogurt base with Apple Scrapple bread and hot microwaved cinnamon apple on top. The combo of bread and hot apple on the cool yogurt was quite good!! Chia seeds and TJ’s peanut butter rounded out the toppings. Mazen and I traveled to Trader Joe’s for a weekly grocery trip. This is what happens when you go to TJ’s sleep deprived and hungry! Some new items literally jumped into my cart without permission! 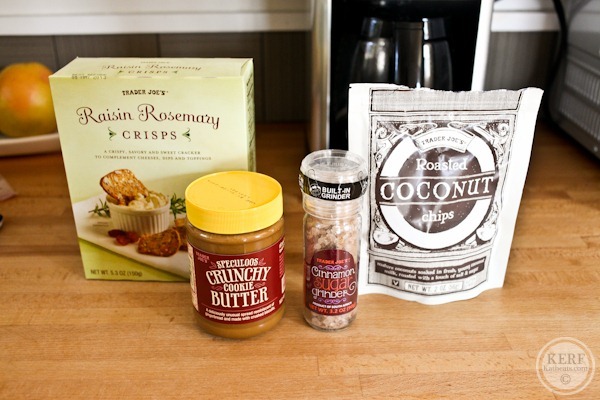 The Raisin Rosemary crisps are soooo good, the crunchy cookie butter awesome (but not as awesome as Biscoff Crunchy(, the roasted coconut chips remind me of this product I tried a while back and loved, and the cinnamon sugar…will be making another appearance. Sooo…I was in the middle of assembling some of the crisps with goat cheese to create some smoked salmon stacks when I decided I wanted to see how the cinnamon sugar grinder worked. I ground it over my plate just so the cinnamon wouldn’t get on the counter and whoops – the LID FELL OFF! All over my lunch! The good news is that cinnamon and sugar go wonderfully with goat cheese, so I dumped the majority back into the container and then ate cinnamon sugar-dusted goat cheese crackers for lunch! 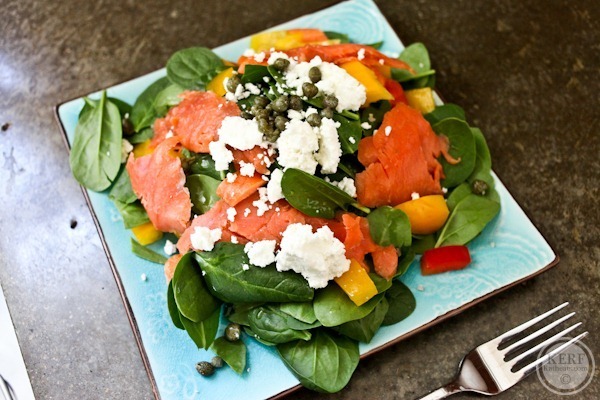 Then I moved my salad to a clean plate and put together a super healthy mix to balance out the sweet crystals – greens, olive oil, veggies, salmon, more goat cheese + capers. Karen came over today and played with Maze while I went to the gym for a quick visit. I did a quick set of weights and 20 minutes on the stairmaster and biked home as fast as I could. Luckily all was calm! Tonight’s dinner was awesome and just one of those “let’s put this in that” meals. We had a fun bag of grits from local Wade’s Mill that Edible Blue Ridge gave us for the holidays. 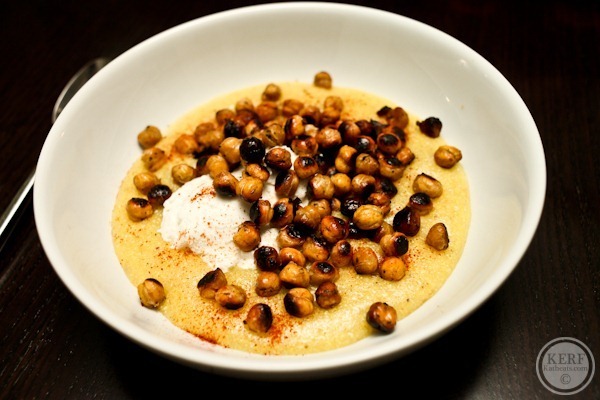 We cooked the grits per the package – they were thick and chunky just how I like ‘em! That big blob of white – more goat cheese!! On top are lemon-dill roasted chickpeas. The beans were drained and rinsed, tossed in a dressing of equal parts lemon juice and olive oil plus a splash of honey and a pinch each of salt and pepper. About a tablespoon of dried dill on top. After a quick marinade, we strained out the dressing so they were close to being dry and roasted them at 400* for 30 minutes, stirring halfway through. Then the dressing was added back after – just for more flavor. This dish was strange, but so good!! 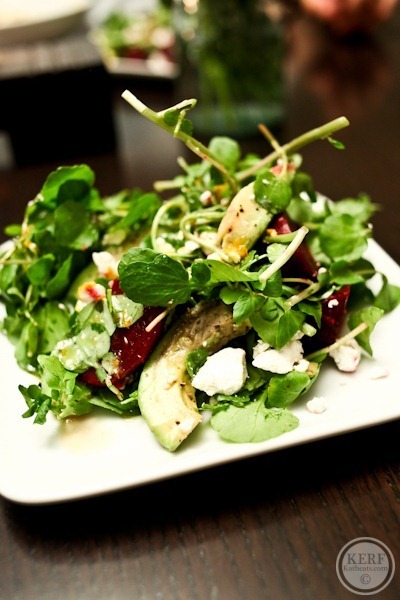 On the side – Karen brought us a lovely watercress, beet, avocado and you-guessed-it: goat cheese salad with an orangey dressing. So crunchy good! Why all the goat cheese? We made some homemade!! I actually wasn’t around to blog about it when Matt and Karen did the process, but I think we’ll definitely do it again and I’ll be sure to share. It’s quite good!! And lastly – our little entertainer!! He LOVES his bouncy seat that Santa brought from Amazon and is just now making the connection between kicking his little feet and making him bounce. It’s SO cute to watch! CRUNCHY cookie butter from TJ’s? I had no idea it existed! I have had the crunchy by Biscoff, and I love it… a little too much in fact. 😉 Glad you got some sunflower seed butter too – that’s always a must for me when I get over to Trader Joe’s. Looking forward to hearing more about the homemade goat cheese! I LOVE goat cheese. That is a heck of a lot of goat cheese (or any cheese for that matter) in one day…between all the cheese and nut butters, I’d be hard pressed to get into my pre-pregnancy clothes (just had a baby). You must have an amazing exercise regimen and metabolism to get away with those generous servings of nut butters and carbs. 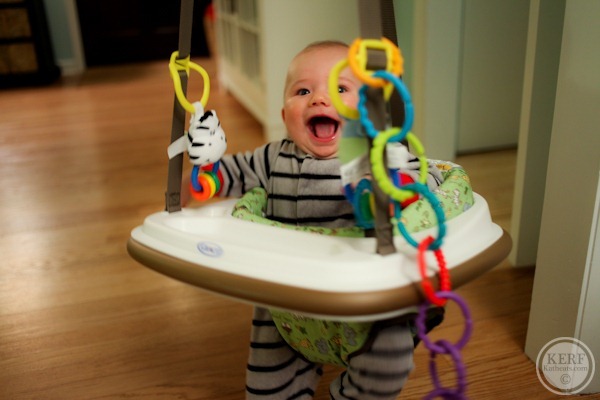 LOVE Mazen in the bouncer…he looks like a very happy boy! I’m sure you mean well, but this type of comment is what can lead people into disordered eating, guilt, and an unhealthy relationship with food…in general, please be careful about the way you word things. Breast feeding can require up to 800 extra calories per day! I would be eating cheese 24/7 if I had a nursing baby! That bouncer seat looks so fun! Do you need to hang it somewhere? Or attach it somewhere? How does it work? You got some good stuff at Trader Joe’s! I need to head over there because it’s been too long. Some of my absolute favorite memories are of my daughters in the jumpy swing! They would really get that thing going. Please make a video of that sometime. I always saved swing time to help me cook dinner. It was awesome. I tried those Raisin Rosemary crisps at my mom’s house of the holidays. So good with some blue cheese and proscuitto! I’d been buying the Raincrisps from WF… so much more expensive and TJs tastes the same. I love roasted chickpeas, and just made a batch of them last week to go with dinner. I think I just added curry and black pepper, but I’ll have to try dill next time (though we never seem to have lemon on hand). Do you or lemon juice? Cute Mazen pics, as always! Definitely some interesting yet yummy combos! Boy if that isn’t the look of pure bliss on his face at the end! Im in love with Maze!! Oh my god! I LOVE the last picture! Maze is soooo cute, that face! Super duper happy! That boy just “makes your day everyday” I think! ENJOY! LOVE that cinnamon sugar grinder from TJ’s! I bought it on my last trip there and enjoyed some this morning on my sprouted toast. Delicious! Mazen is too cute in that bouncer!! Yay! 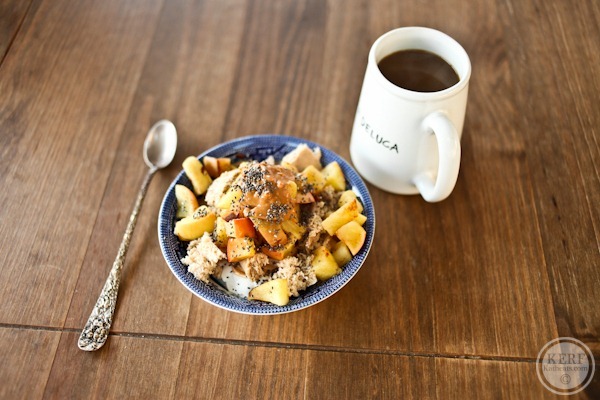 Glad you’re coming around to the cold/hot combos in breakfast! 🙂 Yours sounds delicious! I saw that crunchy TJ’s speculoos and almost picked it up – let us know how it is! That cinnamon sugar grinder catches my attention every time I go to TJs! 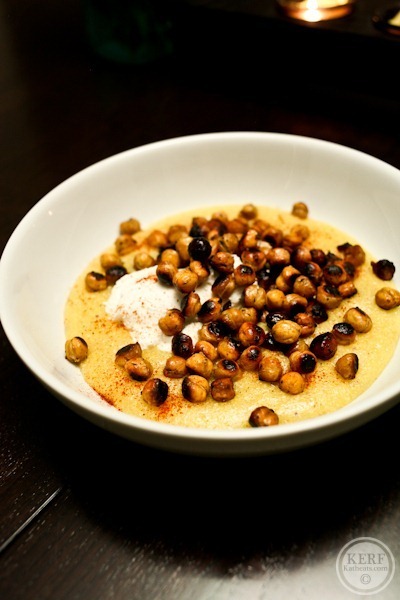 LOVE roasted chickpeas….pairing them with grits is genius!! That big smile– so cute!! I love the way you mix all those different flavors together. I feel like when I try that, it always tastes awful! When you make the roasted chickpeas, are they soft in the middle? Also, wanted to say that I made the bone suckin’ chicken and it’s AWESOME! Will go on my recipe list for sure! THANK YOU!!! Mine were a little soft, yes. Glad the chicken was good! Hahaha definitely some weird eats, I never would have thought to put cinnamon sugar on goat cheese but if it works then it works! My weird combo yesterday was putting tzatziki sauce on cornbread! I had it out for the fish and just went a little crazy with it! It worked! Loving all veggies roasted right now…I must try roasting chickpeas…looks and sounds delish! 🙂 My boys loved their bouncy seat…it was not a swing so I could move it from room to room…fabulous! Oh my! That bouncy seat face! Priceless! All your fabulous baby photos of Maze make me wish I was a better photographer! Those crackers are my fave! Glad to see you like them :). Random meals are oftentimes the best meals! I love it when a strange combination becomes a favorite. Makes me feel creative! 🙂 And wow, Mazen is getting so big! Love it! Homemade goat cheese! Enquiring minds want to know more! Please document it when you all make another batch. Mazen looks quite content in the jumper. I think he is starting to look more like you! Maze looks so happy in that bouncy chair! I had the same thing happen with a new pepper grinder I bought, thank goodness I wasn’t grinding over my pot iof soup but had decided to grind it into a dish to see how course the grind would be it could have been a disaster! I can’t get over it, TJ’s now has CRUNCHY cookie butter?! Well, I am just going to have to make a trip over there ASAP and I’m sure some other items will miraculously jump into my cart as well 🙂 You just can’t help it at TJs! Goat cheese is my absolute favorite cheese. I use it any chance I get! Also every one of those impulse buys from Trader’s have made their way into my cart at some point too, and all I loved. The crackers are something I buy regularly now – I love dipping them in cream cheese! I have a question about the lemon dill checkpeas. Do you store the roasted chickpeas in the marinade after the roasting period, or do you just use it as a little dressing on top, when you are eating the chickpeas? Just curious, it sounds so good. Thanks. The “dressing” actually did de-crisp them a good bit, probably because we tossed the peas in it and it sat for a few minutes before going on the plate. Some of the peas had awesome crispiness after the bake, kinda like french fries. If you only used the dressing as a drizzle you could get more crisp but not as much flavor. Ugh-sorry about the container breaking over all over. I need more goat cheese in my life! Yumm! I’m definitely going to have to make those chickpeas. I love them and that sounds like a fabulous way to make them. i’ve had my lid do that a number of times…you’d think i’d learn to check for security first! My husband and I were just talking about those old bouncers! Remember my sister in one in the 90s but haven’t seen one since. Can’t wait to get our little guy one in a couple months! Mazen in his little jumper is so adorable! He looks like he loves it! I love the TJ’s coconut! I use them in salads with pears and blueberries; so good. That Apple Scrapple bread looks so good. I love apples! 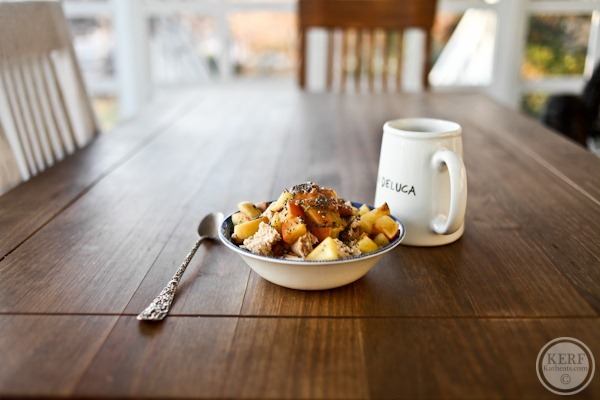 I recently had an apple cinnamon granola pancake with slices of apples baked into it and it was delicious! Cinnamon-sugar pretty much goes with anything I think 🙂 Sorry that happened but love that you made the most of it! I just moved to Indianapolis, where I found a Great Harvest! Just had a 1/2 slice of Dakota Bread and 1/2 Slice of Cinnamon Cranberry Walnut Bread. OUT OF THIS WORLD! I will never go back…. It sure is amazing what freshly milled wheat berries do to bread… not to mention identifiable ingredients. Thanks for turning me onto such a great product! I just bought those TJ Rosemary crackers on impulse too!! Loved them! You are motivating me to make a TJ’s trip.. 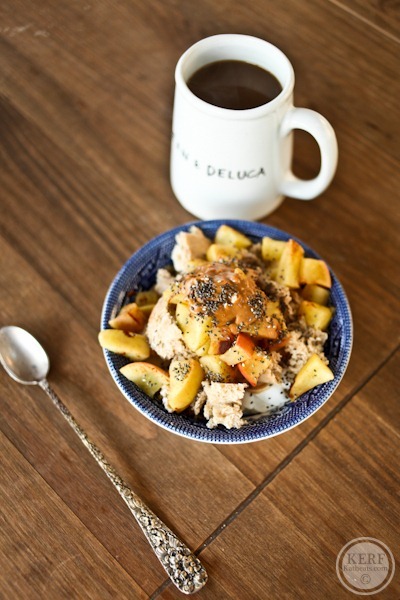 Your breakfast kind of sounds like apple pie – delicious. Such happy baby pics! Love the “bread bowl” idea! I buy these sea salts, just sea salt and either herbs or spices kind of like the sugar cinnamon one you got, so handy, twist and you get a sprinkling of delicious flavour! your breakfasts always make me swoon. I love warm and cool combos. and I might have to add biscoff crunchy to my next groceries list… it’s a little bit too dangerous in my apartment, though. That bouncy seat is so cute!! I just moved to a city that doesn’t have a Trader Joe’s, and I get pretty depressed everytime I see that someone went there!! Man, Mazen is one animated little baby!! Love it. 🙂 I’ve never seen cinnamon sugar grinders before but I’ve always made my own for toast in the mornings sometimes. I’ll definitely have to add that to my list for when I get to check out Trader Joe’s. They’re opening up one in my area and I just cannot wait!! I’ve heard so many good things! 1. How old does a baby have to be to put them in a bouncer? My little one is 3 months and I want to order one stat but don’t see an age range. 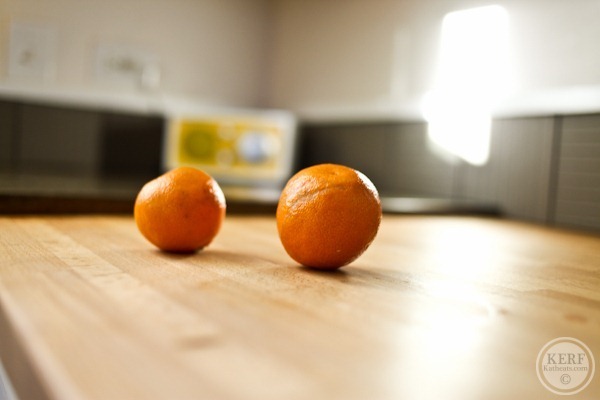 You little guy is so cute it in– I can’t stand it! 2. Would you mind sharing your food budget? My family is trying to make a budget and save money but also value delish, local, and organic food. We also love eating out and trying new restaurants. I would be so interested to hear what your family spends on food. As soon as head control is really good, probably about now. We just started at 4 months. sorry, where is the post? 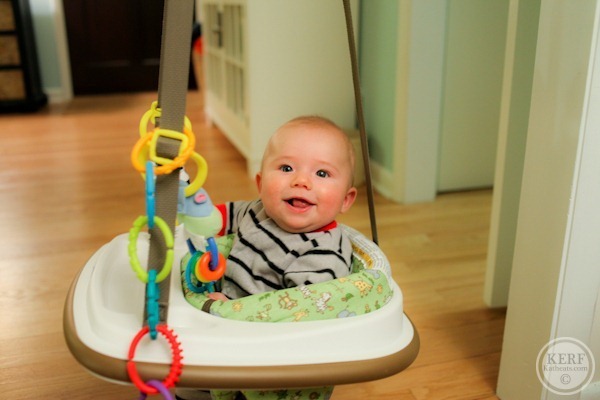 I remember when my little boy used his door bouncer… hours of fun! I love it when combinations of food come together by accident, i guess all strange combo’s start somewhere! That’s so neat that you made homemade goat cheese! I’ve been wanting to try making homemade cheese for a while now, but it seems so intimidating! 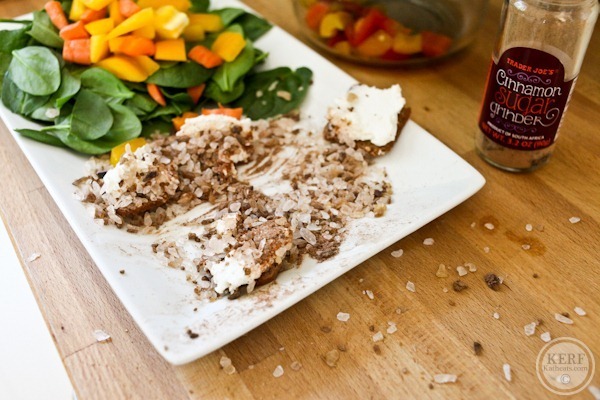 That goat cheese sounds amazing–please share! What is up with the photos? I feel as if I am missing something as all it has is an image that says “I “heart” Katheats.com after every sentence but no photos…is this on purpose? I’d love to see an entire post on the health benefits of nut butters. 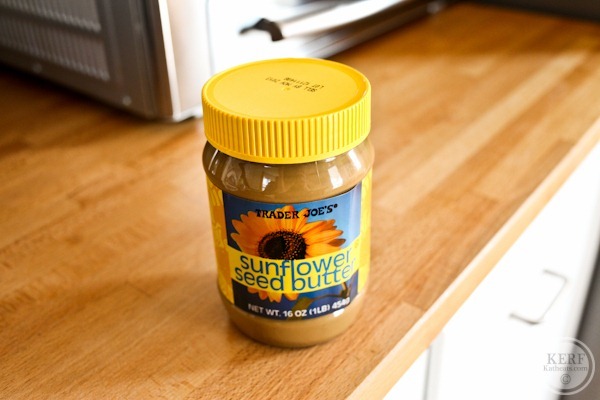 You inspired me to purchase sunflower butter for the first time on my last trek to Whole Foods. Which nut butters are the healthiest and, beyond oatmeal, what are some other ideas for incorporating them into my diet? I’m hoping to do a nut butter post actually, but I just haven’t had time! It’s at the top of my list. You can eat them on everything from celery sticks to apples, inside smoothies, in savory sauces (like a sunflower butter noodle sauce) or as a topping for so many snacks. I was inspired by those chickpeas and made some this morning. 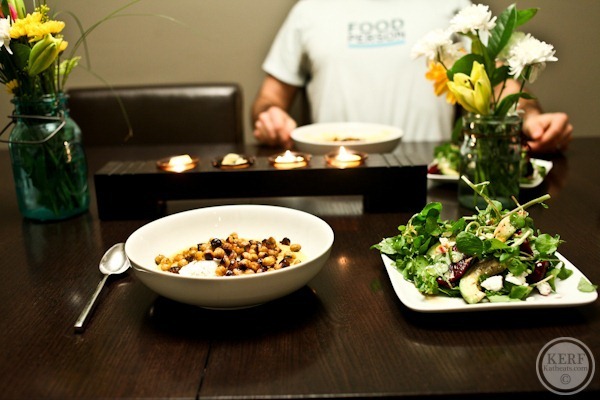 They first made their way to a salad, and then the leftovers went into quinoa burgers for dinner. What an inspiring bean (and blog!). Thanks! flavour combinations are awesome! maybe one day you could try this combination; peanut butter hummus or jalepeno hummus topped with cubed oregano and olive oil feta chunks plus more extra virgin olive oil! another great thing to do with hummus is add a smearing on to ground lean beef ‘tomatoey’ mince and grated cheddar! flavour combinations are definitely fun to experiment with as they add to your cooking knowledge i feel you start to learn what flavours magically work together! Mazen cute as ever- making me think about saying yes to my broody hubby haha! Haven’t been reading blogs for a while, but Maze has gotten so big and is SO incredibly cute and happy looking! Both my sons loved the bouncy seat. It made dinner so much easier. 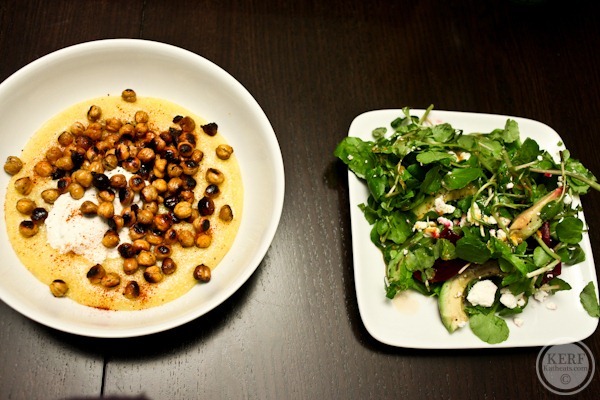 I also love roasted chick peas – I also do on the stove with just olive oil. totally and absolutely loved your strange yet mouth-watering healthy combinations,.. i am surely gonna try them all!! I am in New England and NEED a Great Harvest! Do you ship?!?! I have an extra freezer I can stash all your goods in! We can, but there are several new England stores that might be closer! I will have to check them out and see if they sell as much good stuff as you! Huge yum to your breakfast and lunch! I love combining Greek yogurt with warm oats and apple scrapple bread is divine toasted to get the brown sugar topping all nice and gooey, that sounds fabulous 😀 I saw the new chunky cookie spread over the weekend and almost bought it, guess I’ll have to go back for it! I LOVE roasted chickpeas and adding dill is on of my favorite flavor combinations. YUM! Cinnamon sugar and goat cheese? Who’d a thunk it? Love it! I always love your presentations, and the fact that you try to add something live and raw (for example the watercress salad), so kudos for that/ I have a quick question : I find that goat cheese is a bit too ‘strong’ for my palette. Can you recommend other types of cheeses that aren’t as overpowering? Perhaps feta or a cubed mild cheese like mozzarella?